When looking for a new dining solution, opting for a dining set, as opposed to individual pieces, often works out as better value – plus, you can rest assured there’ll be no unsightly mismatching, or finding yourself with a bench that doesn’t quite fit your table. Whether your style is classic, retro or contemporary, our pick of the best dining sets will help you find a piece that perfectly suits your dining room or kitchen diner. 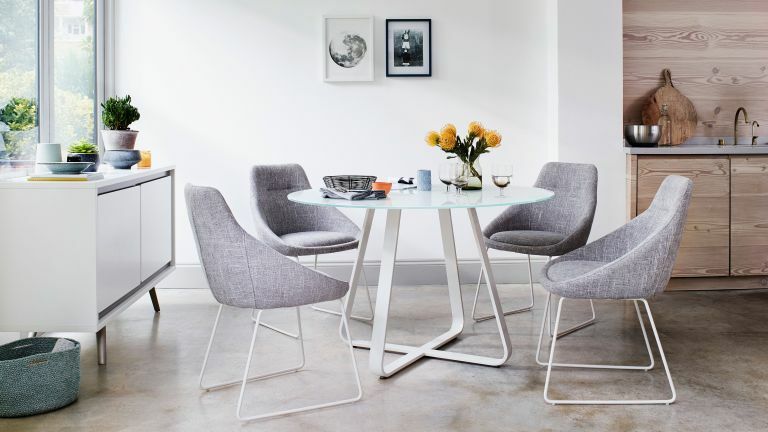 Use our guide to picking the best dining furniture to make sure your choice is spot on. A super-sleek combo ideal for a small kitchen, the Jakob dining set will comfortably seat a party of four. A toughened glass top should prevent sneaky scratches, while each chair is comfortably cushioned and upholstered in a practical grey fabric. It costs £965, Furniture Village. The six-seater Camille dining set has been given a good old lime-washed finish to really bring out the grain of the oak used. This is a great family set for those few meals that don’t take place in the kitchen or in front of the telly. Read our guide to designing a country kitchen for more inspiration. We suspect the Royal family might have different furniture at their grand Scottish residence, though this round six seater dining set is certainly very fetching. The Balmoral set comprises classic, upholstered chairs with a very sturdy mahogany table. Perfect for those envy-inducingly minimalist open-plan dining areas (you know the sort), this clean-lined Damara dining set will seat four lucky patrons – or six, should you invest in a further two chairs. A table, chairs and bench make up this pine Fenton dining set, providing a little adjustability. With its rough sawn finish, characterful knots and grain abound – and at only £427 for the whole shebang, the Fenton’s looking like a bit of a steal right about now. The Fern grey gloss dining set is a great fit for compact, contemporary interiors. The table’s grey gloss finish will work with any colour, and while we love a bit of yellow, the beech chairs are available in subtler hues – including white, black, and navy. This cement-topped table and bench set will deck out your, well, deck nicely, but would alternatively add a pleasingly industrial edge to a dining room – or fit right into an industrial-style kitchen. Crank up those comfort levels with Arden seat pads, which are sold separately. The Lombardy dining table is accompanied by a generous six dining chairs. Made from Welsh oak veneer, this traditional set has been treated to a Scandi makeover with a lick of white paint and padded fabric seat pads. This Lomond table and two-bench set is crafted from mango wood, with bold brass accents. It couldn’t be better for small homes as, when not in use, the benches slide ever-so-snugly under that table. Pull up a couple of extra chairs and you can jam up to eight people around the Lomond. The Jerry four seater dining set includes a cleverly extending table and four comfy, easy to clean white chairs. What could be more perfect for a growing family?